Give your work credibility with a CD back cover insert. 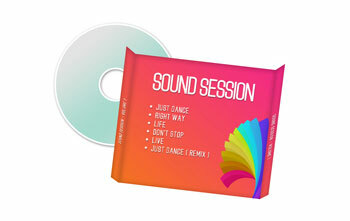 These CD case inserts are printed in full color on quality 100 lb. and 80 lb. gloss paper. The sheets are then cut and perforated so that the finished 4.6" x 5.9" fits easily in a standard jewel case. If you wish, you can add a high-gloss UV coating. We provide downloadable design templates for CD case inserts in a variety of formats, including Photoshop, Illustrator, InDesign, and Quark. These templates provide digital specifications for you to use in designing your insert. You can choose from three convenient turnaround times for your printed CD inserts, including 3 day, next business day, or same day printing turnaround when your files are in before 10 am PT. Back cover inserts are typically used to provide detailed information about what is contained on a CD, whether it’s a musical recording, photographs, design samples, or other media assets. It’s a good idea to double check this information for accuracy before you decide to print. Have someone besides yourself look over the design of your CD case inserts and check that the information on them looks correct. This “second set of eyes” can sometimes pick up on errors or slight discrepancies you might have missed. When you print a back cover insert, you are also printing the spine for your CD. This spine ensures that your CD can be easily identified (and purchased!) when viewed stacked or with only the spine facing out. Because you won’t necessarily be able to control how your CD is displayed, printing packaging that includes a spine ensures your CD will always be seen. Our back cover inserts come to you perforated on each side so that the spine will fit easily inside a standard jewel case. CD Back Cover is rated 5.0 out of 5 by 3. Rated 5 out of 5 by OverAcres from Excellent Product, Quick Service! From working with me on the proof, communication on the order, and shipment of the finished product, this process was fast, thorough and very friendly. And my materials are *fabulous* by the way - I'm looking forward to working with this company again and again!